This article’s research question is: Whether and under what condition family involvement positively impacts firms’ charitable donations? The authors studied 2,921 private Chinese firms’ charitable donations, which are seen as a main part of firms’ proactive stakeholder engagement (PSE). Donations are a discretionary responsibility, which means that firms make their own decisions on whether and how much to donate. Donations also put pressure on firms’ flow of cash and other resources, and thus are short-term sacrifices for the potential long-term advantages of enhancing firms’ reputations and public images and accumulating moral and social capital for the firm. The authors argue that these three dimensions of family involvement positively influence the level of donations. They further tested whether or not the willingness of the next generation to assume control of the firm altered these relationships. Do family firms really have a different decision making process? Do family owners really sacrifice economic short-term gains for the long-term ones? What dimension of family involvement influences the social initiative at the firm level? What is the negative influence of the next generation’s unwillingness to assume control of the firm on charitable donations? This study found that family ownership and duration of control were positively associated with charitable giving. The study further shows that family percentage of ownership and a longer duration of family control have a significant positive influence on charitable donations. However, the next generation’s unwillingness to assume control of the firm weakened the positive family ownership-charitable giving relationship. This study reinforces the role of the next generation of family business leaders on the long-term orientation and pro-social behavior of family firms. 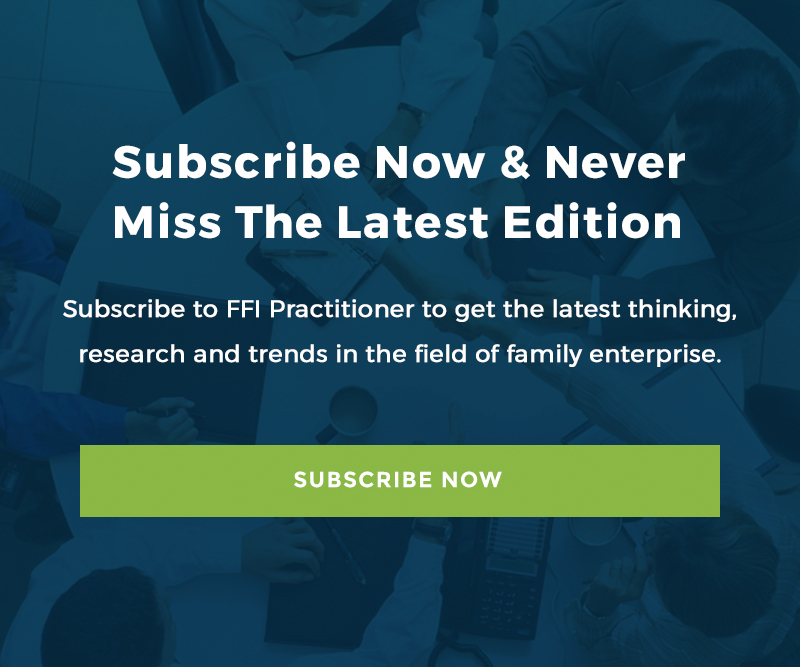 Practitioners will find that this study continues the stream of recent family business research which demonstrates the power of non-financial pursuits in family firms. Practitioners need to continue to be cognizant of the strength of the non-financial pursuits of their clients. Social networks and reputational capital, which can be fueled by philanthropy, are key resources to maintain competitive advantages. As the number of family owners involved in the business increases, their social networks are likely to expand as well. In a somewhat counterintuitive perspective, the authors interpret some mixed survey data to conclude that a greater concentration of family members as managers, in proportion to all family members involved in the company, reduces the propensity for firm philanthropy. They argue that a significant number of family managers leads to more conflict, more divergent views of priorities, less stewardship behavior and more allocation of resources inwardly toward business needs. Further studies are needed to determine whether these propositions apply to larger family firms or might change with a larger sample size across countries and cultures. Practitioners should consider some useful lessons that arise from the authors’ work. To maximize the positive impact of firm philanthropy on the long-term success of a family firm, efforts are needed to help family firms understand the benefits of firm philanthropy and its relationship to business sustainability. Governance efforts are important to help align family managers, family employees and family ownership goals for firm philanthropy. The larger the number of family managers in the firm, the more challenging the governance process to focus and sustain firm philanthropy commitment. Karen L. Vinton, Ph.D. is a 1999 Barbara Hollander Award winner and Professor Emeritus of Business at the College of Business at Montana State University, where she founded the University’s Family Business Program. An FFI Fellow, she has served on the FFI board of directors and chaired the Body of Knowledge committee. From 1997 through 2011, Vinton served on the editorial board of Family Business Review and is the current assistant editor. Karen can be reached at [email protected].